Four months ago I started working as a graduate at one of the most important technology companies of the market and I am so glad of being part of the team of Dell EMC Spain. Due to some work experience and some studies, I realized how important the technology is and how it is changing our ways of life, and I started to have interest about the movement of data that is generated nowadays and how it is managed, so for that, Dell EMC was the perfect company to develop my career in this industry. Dell EMC is not just a company that helps its customers to manage their information and helps them to transform their business, it also helps their employees to grow, personally and professionally. Every week in Dell EMC is more interesting and we have tons of events, in each one, we learn something new. My first event at the company was a meeting about the importance of cyber safety and how we must manage our social networks, especially in a professional way, to become more attractive to users. A few weeks later, we had another event organized by Dell for Entrepreneurs about virtual reality. We had testimonies of three different companies that were devoting themselves to help users (companies, hospitals, employees, patients…) with the most advanced technology. For example, one of them was helping people to overcome their fears through virtual reality glasses. It was not as good for me, because testing the glasses made me discover I’m afraid of heights! 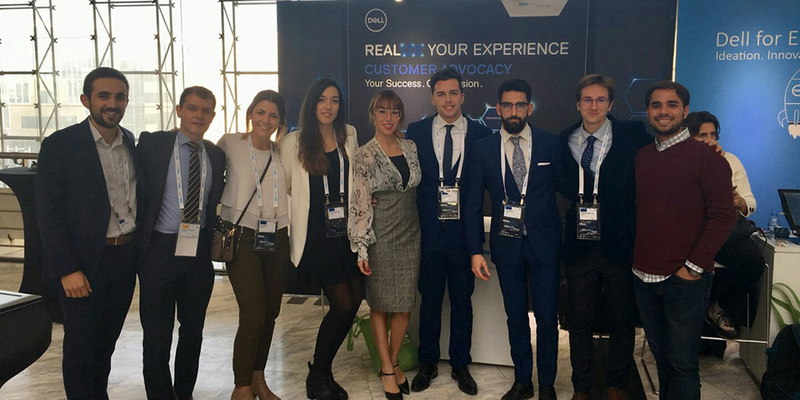 But the event of the year was yet to come: Dell EMC Forum Spain held on December 12th. A technology journey developed for professionals of the IT sector to discover new strategies, acquire innovative perspectives and explore new solutions that the company offers. There were around 1.500 participants!! It was a great opportunity for me (mostly because I had only been working for the company for a month at that time) to meet some clients, partners and especially, colleagues at Dell EMC. And also to know the new technologies of the market, the most amazing products of the company and how is Dell EMC introducing and modernizing the technology in this digital age. It was a very interesting and entertaining day since where we didn’t stop learning, and connecting with a lot of people. We also had another gathering about the tendencies of employment nowadays and the new options and opportunities we have inside and outside the company and how we can collaborate to improve them. We have English lessons every week for free, we also had a session about financial planning and a contest about some associated products to Dell EMC. Undoubtedly, we do not get bored at the company, we have a lot of interesting activities that are managed by the different organizations (Employee Resources Groups) such as Conexus, Genext, Planet, Pride, True Ability or Woman in Action dedicated to support different groups with events and activities. To sum it up, Dell EMC is a great company to develop yourself both personally and professionally. Thanks to the events that the company holds you have the opportunity to grow up both, individually and also as a team.